5 Acres & A Dream: Um, Is This Something I Should Be Concerned About? Um, Is This Something I Should Be Concerned About? I'll be the first to admit I'm not a chicken expert. Any time I think I've got them figured out, they turn around and do something new to amaze me. Much of it I read about from time to time in books or other blogs. But here's something I've not read about anywhere and to be honest, I'm not sure it's "normal." 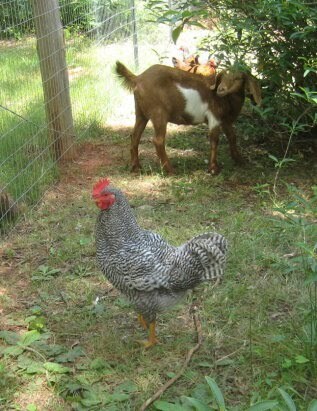 Lord B, my Barred Holland cockerel, loves the goats. Seriously. 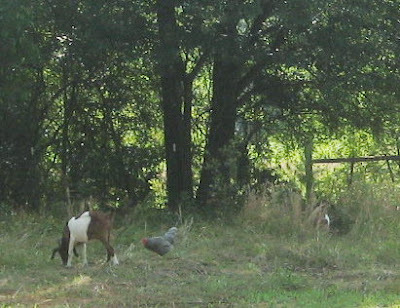 When I let the chickens out to free range in the late morning, he immediately runs around to find the goats. When he finds Baby, he runs up to her and does a little happy dance. Then he follows them around, accompanying them for quite a bit of the day. If you look closely at the photo below, you can see Abigail. And His Lordship is there as well. ... it's just that he seems more interested in goat business than chicken business. .... he will always come greet me when he sees me. 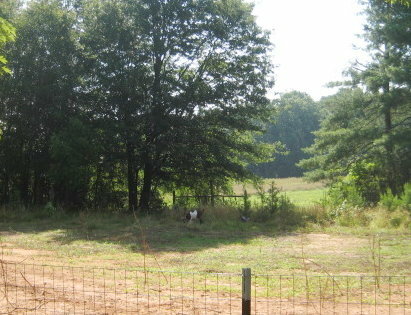 Then it's off with the goats again. I'm really not sure what to think of it. That's so sweet. :) He's adopted a little flock of his own. I wouldn't worry about it. I've seen animals make trans-species bonds fairly often. My parents' dog (now deceased) was very bonded to their cat. When that dog was ill, the cat would catch "treats" outside and bring them in for the dog. And one of our dogs is very bonded to one of our cats, but not to the other cat. They groom each other, check on each other, sleep together, etc. It's interesting to watch. Keep us posted! 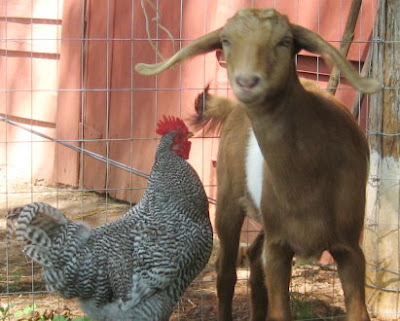 Is this rooster the one you were planning to keep? If not, you might consider keeping him around, just in case, since it seems he'd stay out of the other's way. That is hysterical - I know Kathy's chickens will nest on her sheep at night and she gets mad 'cause they poop all over the wool - what is it the cat bloggers say Not of My Species Friends - looks like you've got it. T.
At least you know he isn't a bigotted rooster. Actually, I really like this in him. He knows how to pick his friends. 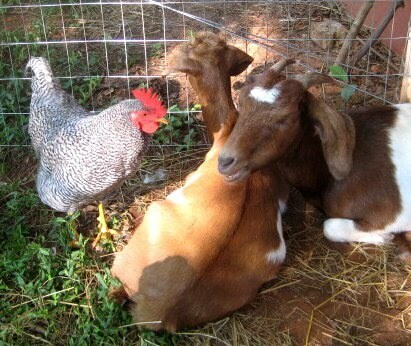 when I was a kid our neighbors had chickens & a horse. 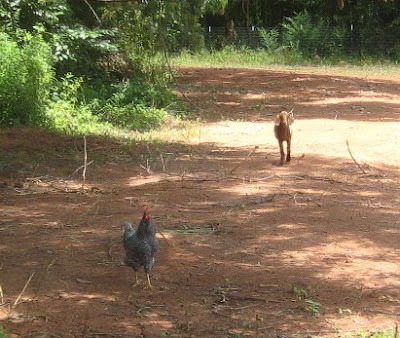 For the most part the chickens stayed clear of the horse...but have the horse defecated the chickens all came running to go through the droppings. I sure hope the horse didn't have parasites of some sort. I think its cute, likely nothing to worry about as others have said. I have friends whose banty rooster took a liking to an abstract chicken lawn ornament that i gave them. He'd coo to it and fuss over it, tried to preen its oblique plastic beak. He'd go into a tizzy when it would rain and this statue wouldn't head for cover with the rest of his ladies. 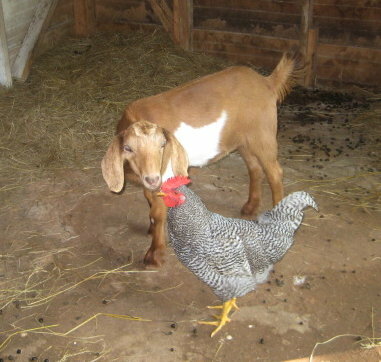 The relationship, doomed to failure, was eventually abandoned in favor of the real hens. I've a friend who has a couple of turkeys. The hen hates the tom and hangs out with the chickens, avoiding the tom as much as possible. I've heard lots of stories about goats befriending horses and of course stock dogs, which see themselves as part of their flocks! Your rooster may just be infatuated and find his way back to his ladies. But, have you read Family Friendly Farming by Joel Salatin? 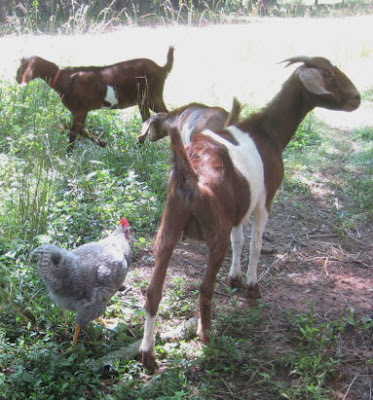 He purposefully takes his hens out after his livestock to eat the flies or larvae (can't remember which) in their poop - good for the hens, good for the farm. I was very curious to see what commenters would say. I was thinking it would be something along the lines of how birds imprint on the first thing they see when they hatch, or something like that. But I'm definitely not a farm person! I love the pictures of the goat and rooster together!! I could definitely have fun photographically speaking with that combo!! They're both gorgeous animals. I remember our goats being just like that. They were as much fun as my dog, which is why my parents never could get me to eat goat. Or rabbit either, for that matter. Since the chickens regularly beat me up, I had and still no problem eating them at all! Maggie, yes, he's the keeper! It's really the funniest thing. Makes having animals so much fun. Robin, actually he hasn't been the least bit interested in the goat droppings, though another one of my roos is. He does like to peck at their coats though. Maybe for flies? Tina, they really are friends not of my species, aren't they? I didn't know that about Kathy's chickens and sheep. Hilarious! Bettina, there certainly are enough flies around for that and no chicken would pass up a tasty fly. Even so, he just genuinely seems to like her. Benita, I really like it in him too. A rooster with personality! Renee that's so funny about the chickens and horse poop. Another thought, they could be looking for undigested grain. Icebear, that is too funny! Don't you wonder what goes through animals' minds sometimes? Nina, maybe that hen doesn't know she's a turkey! I think part of it is a maturity issue. I read that Barred Hollands mature later than most breeds. I suspect that one of these days he'll "wake up" and realize what a rooster is all about! Heather, thanks for the book recommendation! I've heard of Joel Salatin, but never ready his works. That sounds like a good one. Runic Rhyme, we thought about a LGD, but maybe this is just as good! Sharon, it's too bad you had such mean chickens! 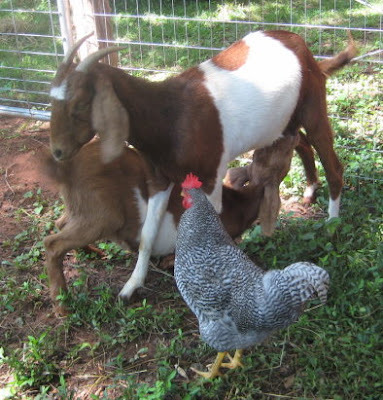 I can eat goat, but not sure how it will be when we raise our own for meat. 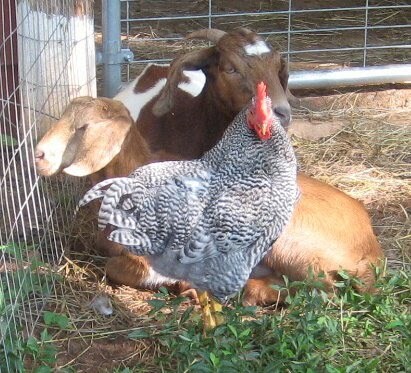 I think that's a fabulous cockerel with his pals the goats. You could write a lovely children's story and illustrate it with your photos. Maybe he was a goat in a previous life? I dunno but it's probably a lot of fun to watch. Deep End, LOL. Who knows???? I think this is called luck :) Lots of animals coexist very nicely and it's a good thing!